I was on a photo shoot for the Danish Cancer Society a couple of weeks ago. 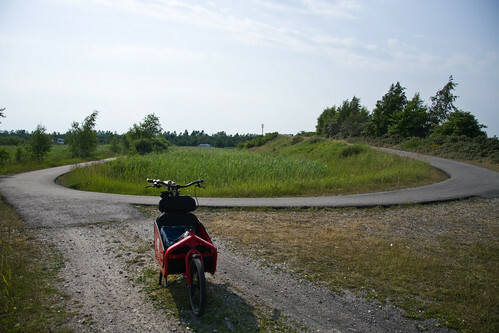 Cycling along the old defences of Copenhagen, taking pictures of recreational bicycle infrastructure. The Cancer Society is focusing a lot on cycling and exercise as preventative measures against cancer in this sedentary world. The route took me over a motorway section that I'd only ever driven over in a car. Sjællands Bridge, which is the main motorway if you're heading to Sweden from Denmark. Needless to say there is a wide cycle track over the bridge. There are fewer commuters on this route during the week, compared to parallel cycle tracks along other motorways leading into the city, but the weather was nice - 35 degrees - and there were many people going for bike rides. On either side of the bridge the bike route runs parallel but more separated by trees - it's a motorway for god's sake, who wants to ride next to it? - but above is a lovely detail. 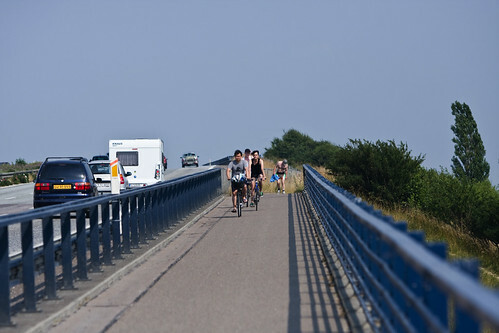 There is an overpass leading bicycles and pedestrians over the motorway. It is wonderfully designed. A long, sweeping arc that makes it an easy climb for all the different kinds of people on bicycles who use it, including children. Brilliant, people-friendly design detail. They could have just cut it short and made it a sharper, steeper turn up to the overpass. But they didn't.